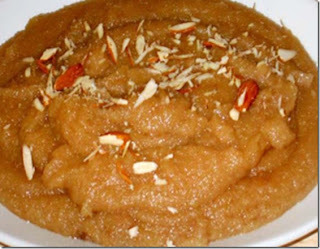 Discription:This halwa tastes so great and its very nutritious and good specially in winters. Try to make it in non stick pan because gram flour burns so easily in other pans. Cook this halwa on very low flame for good result. Heat ghee in non stick pan, add cardamoms and fry them for few seconds. Add gram flour and cook it on very low flame stirring continuously. You have to cook the gram flour at least for 15-20 minutes. Add half balai after 10 minutes and other half after 20 minutes. When sugar dissolves then increase the flame to medium and add milk and stir till milk is mixed thoroughly. Stop cooking when halwa leaves the ghee. Add nuts and serve it hot or cold.